This is a funny, heart-warming book, full of great, odd characters who are only great, and odd, because they seem so real. Atticus Craftsman is part of the Craftsman and Co publishing dynasty family. The company has decided to shut down one of their magazines (Librarte) and so Atticus is sent to Madrid to begin the process. The little magazine only has five employees, and they never appear to be particularly good at the jobs, but they are delightfully off-beat. Atticus is a sharp contrast to these carefree, loving, wild Spaniards, with his stiff-upper-lip and his supply of Earl Grey tea. The women of Librarte hatch a plan to distract Atticus from shutting the magazine down. From kidnapping to the promise of a recently discovered, previously unknown document by Federico García Lorca, the women keep Atticus out of the picture as best they can. But Atticus’ disappearance hasn’t gone un-noticed. He hasn’t checked in with the home office in three months and his father has the local police investigating. But his father has withheld the disappearance from Atticus’ mother. Inspector Manchego is a bit of a bumbling fool and easily manipulated by the women of Librarte, but he doesn’t give up on his search for Atticus. I have read so many books over the past few years in which none of the characters are likeable, but here we have just the opposite – EVERY character here is delightfully unique and lovable. It might be easy to make Marlow (Atticus’ father) the ‘bad’ guy for wanting to shut down the magazine, but even he is someone real and very likable by the end. The end …. Oh, author Mamen Sánchez really manages to hit the ultimate climax with this ending. I don’t want to give too much away but the ending touches a lot of lives and if your heart doesn’t beat just a little faster you’re a mighty cold individual. While this book should be enjoyed by anyone who enjoys reading fiction, it will have special appeal to fans of My Big Fat Greek Wedding and Mama Mia. Looking for a good book? You’ve found it. 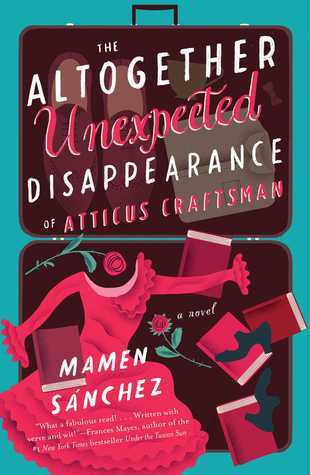 The Altogether Unexpected Disappearance of Atticus Craftsman by Mamen Sánchez is a sweet, wild, tale full of quirky, lovable characters. You should read this.